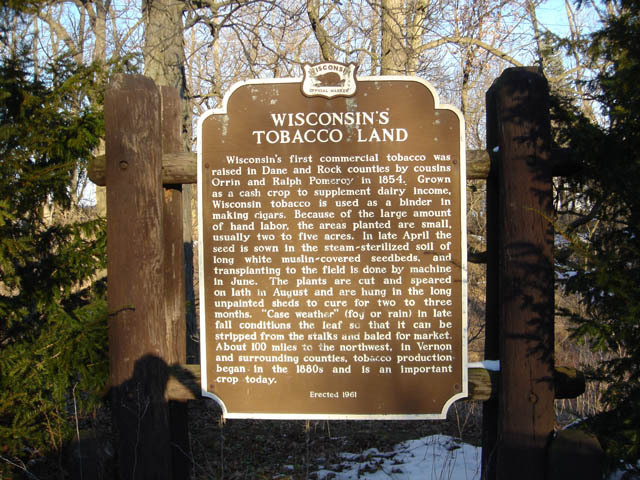 Located East side US 51 on pull off just before Rock River Bridge Coordinates Lat N 42:49':07" Lon W 89:04':18"
Wisconsin's first commercial tobacco was raised in Dane and Rock counties by cousins Orrin and Ralph Pomeroy in 1854.
ripped from the stalks and baled for market. bout 100 miles to the northwest, in Vernon and surrounding counties, tobacco production. began - in the 1880s and is an important -crop today.